Members of APLTI, who rallied to restore their local wetland and lake. 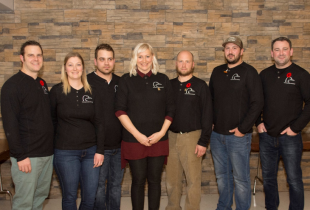 From left to right: Réjean Vézina, president; Daniel Pinette, administrator; Martin Turcotte, vice president; Benoît Lemay, treasurer; Catherine Lemay, secretary. In 2011, Réjean Vézina was ready to enjoy a quiet retirement. 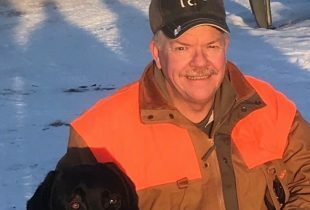 Instead, he found a new passion: rallying the health of a local wetland. Vézina lives in Irlande, a rural municipality nestled at the foot of the Appalachian Mountains in southeastern Quebec. People visit Irlande for its rolling landscapes and proximity to cities like Sherbrooke, Trois-Rivières and Quebec City. These charms drew Vézina here over seven years ago. “It’s a beautiful region,” he says. 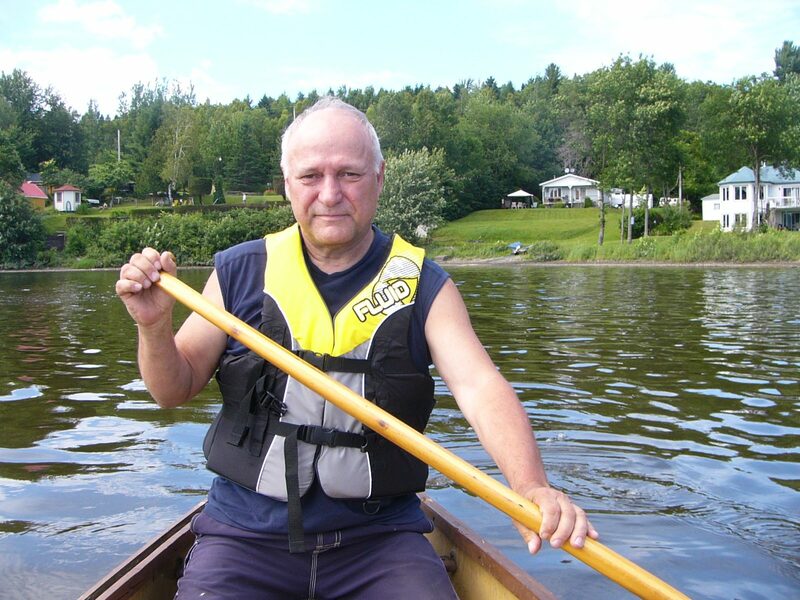 Réjean Vézina enjoys retirement, paddling on Lac à la Truite. But shortly after he moved to Irlande, Vézina’s neighbour approached him to discuss their local lake, Lac à la Truite. Years of asbestos mining, run-off, and wastewater flowing upstream past an eroded dam at nearby Étang Stater wetland, had polluted their lake. Vézina was compelled to act. “To tell you the truth, I don’t know what pushed me to become involved, but doing nothing wasn’t an option,” he says. Moss and blue-green algae cover the surface of Lac à la Truite. “Locals don’t benefit from the lake anymore,” says Vézina, noting the water is unsuitable for swimming and questionable for fishing. 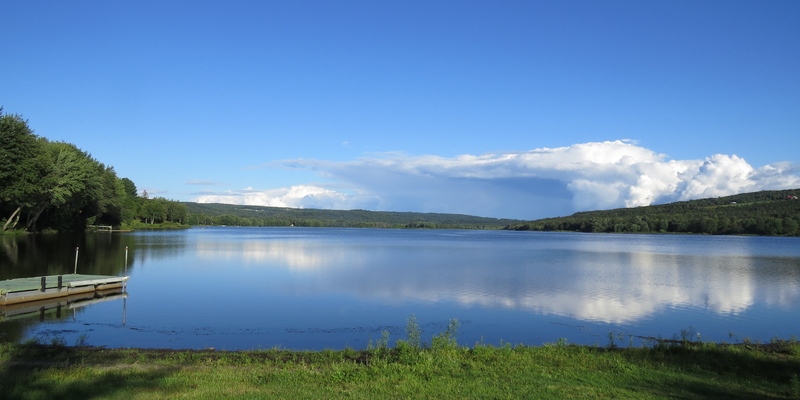 The state of the lake’s health today is tied to a toxic history of asbestos mining in Quebec communities that increased dramatically in the 1950s in places like Thetford-Mines. Here, in 1954, a mining company constructed a dam on the western edge of the Étang Stater wetland, two kilometres upstream of Lac à la Truite. This dam would be needed one year later when the mining company began to drain Lac Noir, a large lake 11 kilometres upstream of Lac à la Truite. Their goal: to access the asbestos beneath Lac Noir’s lakebed. The dam slowed the flow of water so that it could be filtered (and sediment would deposit) in Étang Stater before entering Lac à la Truite. Neither the wetland or the dam were up to the task. “All the mining … caused big mountains of dirt to make their way into the water,” says Vézina. As a result, water levels at Lac à la Truite went from nearly 8 metres deep to under three. Fast-forward to 2011. Public outcry and political pressure led to the closure of Canada’s last asbestos mines. By then, the dam at Étang Stater was in total disrepair. On especially rainy days, sediment would make its way from the wetland, into the lake. Vézina says that for him and others, “the thought of doing nothing was really sad.” And so, they mobilized. In 2013, residents collaborated on a memoir that traced the decline of their lake. This document led to the formation of a local action group called, L’Association de protection du Lac à la Truite d’Irlande (APLTI). One of APLTI’s first objectives was to have the dam at Étang Stater restored. Repairing the dam would allow the wetland to resume its role as a filter, and feed water—not sediment—into the lake. 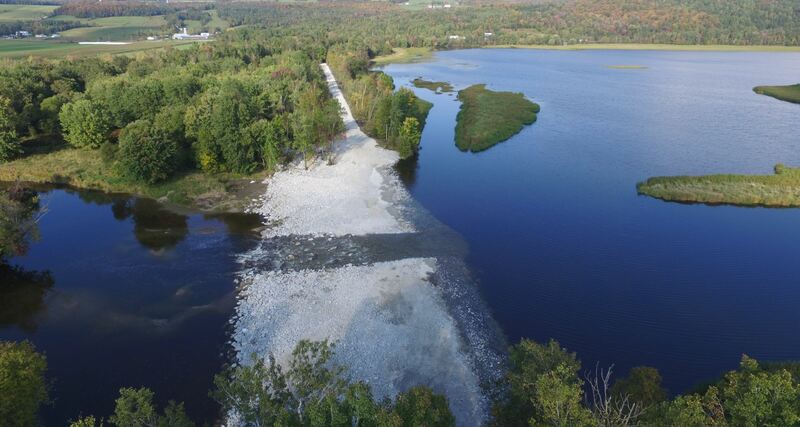 An aerial view of the dam that DUC conservation staff and engineers repaired at the Étang Stater wetland. While members of APLTI were eager to improve the health of their lake, they needed help. They reached out to the wetland experts at DUC. “It was thanks to DUC that this project moved forward,” says Vézina. APLTI co-ordinated funding sources, and last fall, DUC undertook the repairs to update the dam, which included adding a fishway. Now, the 257-acre (104 hectare) wetland filters water before it continues into lakes downstream, and provides habitat for breeding and pairing birds. The new fishway allows native fish species to navigate between the wetland and lake. Wetlands of this size are rare in this part of Quebec. “Which is why it’s so important to protect [this wetland],” says Claudie Lessard, a DUC conservation specialist. Lac à la Truite, Irlande, Que. 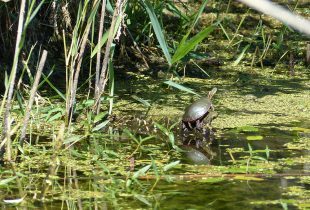 Without the pressure of trying to filter water from drained lakes, Étang Stater can now operate as the natural wetland was intended: slowly and effectively. The dam built for industrial ends has been restored for the health of a wetland and lake. Learn more about how DUC’s work is helping Canada’s fresh water.